Today was Working Women Wednesday’s on That Business Show with Jamie Meloni and the show kicked off with a call from the CEO/Founder of Working Women of Tampa Bay, Jessica Rivelli. Jessica spoke of the Women’s Final Four and some of the events and games she was able to attend and some of the takeaways from the event. Learn more about this influential group at http://www.workingwomenoftampabay.com. The show today was a group discussion on today’s workforce with Michele Norris, Founder of Navigen Leadership and Bevan Rogel, Founder of Encore Tampa Bay. Michele’s company focuses on educating and coaching both employers and employees on the ever-changing workforce landscape and we focused specifically on the role of the Millennial Generation and their influence on the workforce and the challenges and opportunities they face as well as how Michele assists employers on working with the Millennial Generation. Bevan’s company focuses on the Baby Boomer generation and their return to the workforce either in an employee role or as a new entrepreneur. The Baby Boomers are one of the largest and best educated generations of all time and the word retirement is not in many of their vocabularies. Longer life, the economy and personal choice are some of the driving factors that are keeping the Baby Boomers in the workforce longer and the Encore movement is not just a local organization but has national reach and Bevan was chosen as 1 of 14 individuals across the country to create a model for creating an Encore Community in Tampa Bay. Through Encore, baby boomers are getting their encore appearance so to speak in the workforce. Both Michele and Bevan offer many great workshops and coaching sessions as well as resources to assists Millennials and Baby Boomers and employers. Reach out to Bevan directly and be sure to request how to get a copy of the Encore Resource book and inquire on an upcoming workshop to enhance your skills and get you ready for a career transition, learn more at http://www.encoretampabay.com or contact Bevan directly at 813-890-1010 or email – encoretampabay@gmail.com. 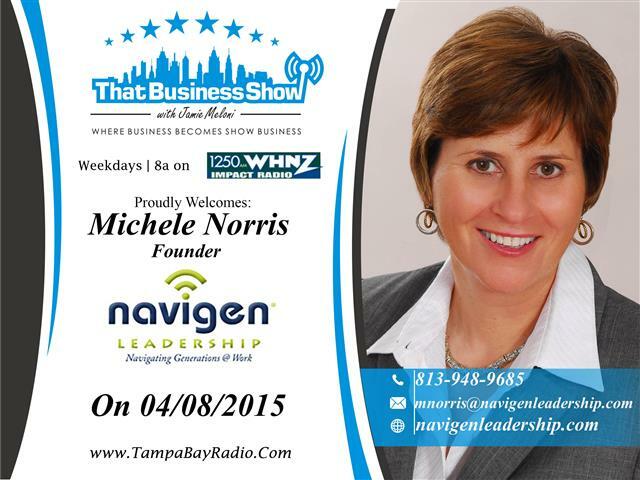 Michele is a great resource to both Millennials and employers on how to cope and adjust effectively to the new workforce and she too offers many great workshops and coaching opportunities – learn more at http://www.navigenleadership.com or contact Michele directly at 813-948-9685 or email – mnorris@navigenleadership.com!